I wanted to write this topic last week but I decided to take a short break from this blog. I still can't get my head off Space 18 where it's verified Kyuranger takes place in another Universe. 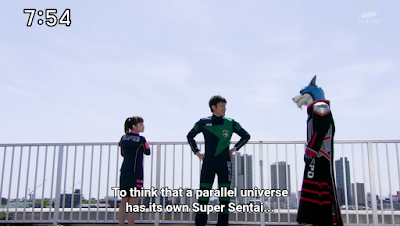 This further backs up my Multiverse Theory where Toei's shows usually take place in a separate continuity. Some of them may be direct and/or indirect sequels to each other while most of them happen to be in their own continuity for a reason. If you think Super Sentai was originally meant to take place in the same Universe then you need to take a closer look. The VS. Movies tend to have events that contradict series proper. Most series tend to act independently from each other. You can have the same motif but they act independently. Let's take for example. I always wondered what role would the Dekarangers and Gavan have in a Universe taken over by Jark Matter. The answer turned out to be none. The Kyurangers landed in an entirely different universe that wasn't taken over by Jark Matter. Kyuranger is a huge what if the Universe is already taken over by the enemy forces. This is an example of how going self-contained can help writers have more room for new ideas without having to dig all the way from Goranger to Zyuohger before they start their ideas. If we're going back to some older Super Sentai you'll probably notice some things. Events tend to happen independently. As of recent, I'm watching more of Hirohisa Soda's Super Sentai and beyond and noticed some events can't happen in the same continuity. Bio Robo's awakening happens only when the Earth is in danger. The Earth Force in Changeman only activates when the Earth is in danger. The events from Zyuranger up to Ohranger are mutually exclusive to each other in contrast to Mighty Morphin up to Zeo. Also, notice how Ohranger vs. Kakuranger as well as many VS. Universe have events that are pretty much out-of-continuity. Not to mention Ohranger, GoGoFive and Winspector all have their plots taking place in the Year 1999 which wouldn't make sense if they were all in one continuity. It gave me a thought of how Metal Heroes do have a fragmented continuity. Gavan, Sharivan and Shaider take place in the same continuity but later seasons were mostly self-contained. Janperson started off as its own continuity but for some reason got involved with the continuities of B-Fighter, B-Fighter Kabuto and Blue SWAT's continuity. Winspector, Solbrain and Exceedraft are all indirect sequels to each other. Also, Exceedraft was supposed to be its own continuity but it was later changed for some reason. Zyuranger, Abaranger and Kyoryuger are pretty much their own continuity. 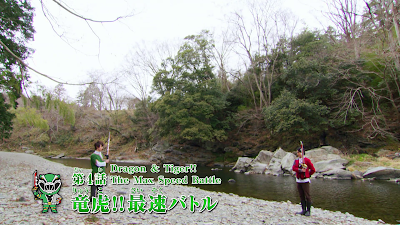 Dinosaur extinction may vary from Super Sentai to Super Sentai. Boukenger and Go-onger show events that couldn't match up to how dinosaurs went extinct in the dinosaur trilogy. Even the dinosaur trilogy has different explanations how dinosaurs died. None of the villains ever had hints they actually knew each other in the past. This leaves room for creativity to how to modify an already existing them. But these three aren't the only series where a trilogy took place. 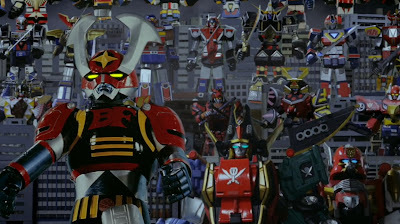 If you think about trilogies we also have the ninja trilogy (Kakuranger, Hurricanger and Ninninger), the martial arts trilogy (Maskman, Dairanger and Gekiranger), the automobile trilogy (Turboranger, Carranger, Go-onger) and the sibling trilogy (Fiveman, GoGoFive and Magiranger). But all these series act pretty much their own continuity. Ninninger may take place in the VS. Universe but you didn't need to watch Hurricanger and Kakuranger to understand how events unfolded. Carranger and Go-onger aren't dependent on Turboranger's continuity. GoGoFive and Fiveman operate independently from each other. Most of them tend to write at a fresh new start. 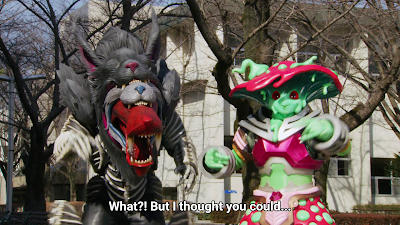 This also means that Super Sentai villains are also a fresh new start with fresh new ideas. 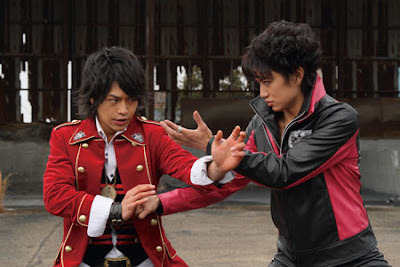 Gokaiger's Zangyack is a huge what-if scenario if all 34 series were crammed into Gokaiger. Kyuranger's Space Shogunate Jark Matter didn't need to explain why the other 40 Super Sentai weren't there when they took over the Earth. 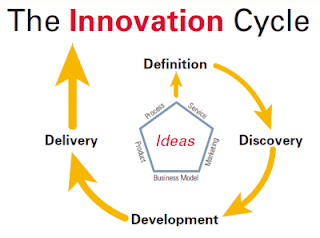 Let's take a look at more instances how fresh new ideas taken place. Most villains tend to have plots that just can't be put into one continuity. 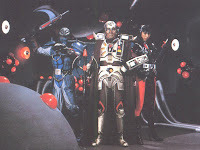 Changeman's Gozma has been conquering planet after planet for its ruler Star King Bazoo. Flashman's Mess has been messing up with the galaxy through genetic experimentation. Fiveman's Silver Imperial Army Zone has been gathering negative energy by destroying planets and it needs Earth to be the 1,000th planet. 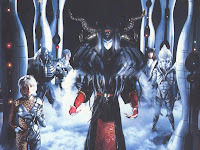 Zyuranger's Bandora Gang was responsible for dinosaur extinction couldn't agree with other Super Sentai villains who were also responsible for the same event. But you have to admit it's all a fresh new start for villain ideas isn't it? I can also mention that what I don't like about old school Kamen Rider specifically most of the Showa era is the recycling of the Great Leader. Today, Great Leader is just a punching bag for the Heisei era which may prove his concept aged badly. Back then, almost every Kamen Rider were somewhat linked by the Great Leader who founded most the evil organizations that harassed the Kamen Riders. Kamen Rider Black was a fresh new start but Kamen Rider Black RX retroactively pulled it back to the other Showa era. This is different than most Kamen Rider series of the Heisei era were most of the villains tend to operate independently from each other for most of the franchise' run. I don't find myself such a huge fan of the crossover movies but some of them are pretty good what-if scenarios. 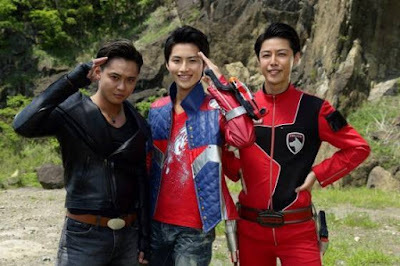 It's no secret how I really hate Super Hero Taisen's first entry but Super Hero Taisen Z managed to give a better plot. But what's the advantage behind having crossover movies leaving more room for the writer's imagination? Take a look at how most of these movies operate. 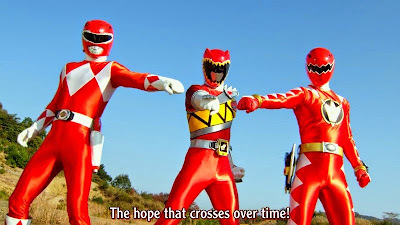 While Gokaiger did try to link the events of Goseiger vs. Shinkenger into its continuity but most of them are a fresh new start. The VS. Movies may or may not ignore events. A good example is how Ohranger vs. Kakuranger placed in a lot of creative thinking without relying on the events of both series involved. Bacchushund is still alive and Buldont is still a child yet all the Ohranger mecha are there. The Kakurangers supposedly gave up their powers but they still had it there. The same went for a lot of VS. Movies where non-canon villains are added for the sake of a what-if scenario. I guess using the Multiverse format can give more room to creatively think of how to make up the toys. I mentioned some time ago in this post about the trilogies in Super Sentai. Their mecha have very different backstories from each other. Take for instance how Turboranger and Carranger have different ways of handling automobile mecha. Dr. Dazai used a bizarre combination of magic and science to make their mecha. 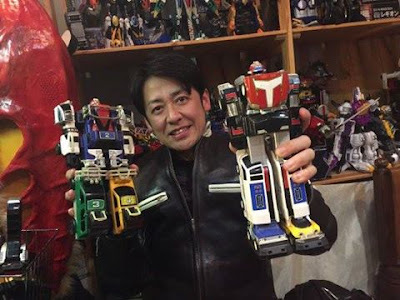 Carranger's initial mecha were magically produced. Carranger didn't need to rely on Turboranger's continuity to create its own set of mecha. Go-onger also didn't need to rely on Carranger and instead took the liberty of making talking car mecha mixed with animal motifs. The same goes for almost every Super Sentai. It's a fresh new start for mecha innovation. I guess all these translate into a richer inventory of toy sales huh? Pretty much, I hope I've made my point in addressing how I think the multiverse format works better. I'm also thinking of how a lot of American superheroes tend to lack creativity due to the use of a single universe format (though there are what-if dimensions) but there's still some advantages of using it. In the end, it may just be a case-to-case basis. Super Sentai is what I'd call a series where innovation really either hits or miss because you gotta sell more robots and weapons, right? Well, there was a time I actually enjoyed Super Sentai for actually getting THAT ambitious. Now it's time to consider Super Sentai along with some Metal Hero and Kamen Rider shows that I thought got too ambitious and perhaps too ambitious for its own good. This episode now features "Hell's Guard Dog" -- no I'm not talking about Doggie Kruger. Rather, I'm talking about Cerberus (and the monster's design is AWFUL tbh with three heads coming out of each other rather than the standard Cerberus I'd like to see). This episode starts to have some early-on character development for the siblings Banba and Towa. Banba useth the Answer Soul on Ui to find out how the Menasaurs are born. She calls meeting Creon who had used some slime on her. The Ryusoulgers come to the conclusion that they have to destroy Creon. Meanwhile, Towa meets a young girl named Sanai who is taking care of an abandoned puppy. It's heartbreaking how this happeneth a lot. Every life is precious isn't it? Well it dependeth but we ought to be protecting life from those who destroy it. Towa starteth to understand that Banba's rather warped principle of killing one life to save many can be a very dangerous thing! Kyuranger 18: It's Another Universe After All? !